I first learned about Mentaiko from Cheesie’s blog. Her obsession with Mentaiko is rather endearing and this entry made me chuckle and envious at the same time. Since then I’ve been seeing Mentaiko everywhere on blogs and restaurant menus. Lately though, Mentaiko Pasta seems to be all the craze around here and after seeing yet another blog about this dish, I’ve decided to give in to the temptations and cook it myself. 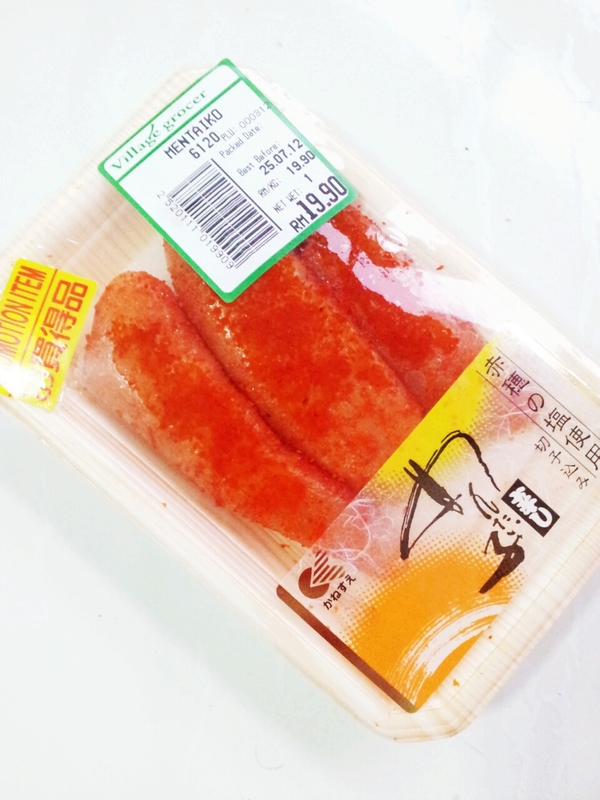 Also called Karashi Mentaiko, the cod (or pollock, really) roe is salted and flavored with Japanese chili pepper (togarashi). The flavour is unique, reminiscent of the taste of sea, and most definitely umami. 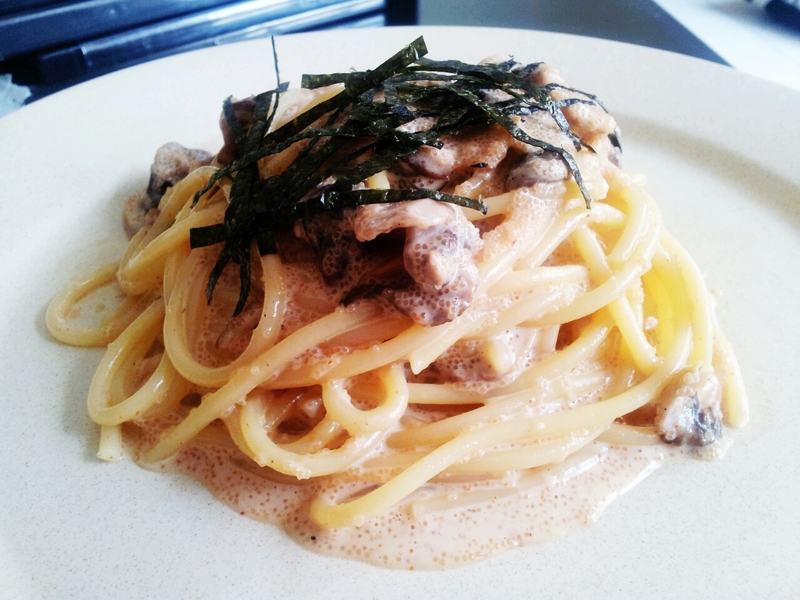 If you like anchovies or other salted fish variety, you would surely love this dish. In fact, most people around me have been waxing lyrical about it. Ladies and Gentlemen, introducing Mentaiko! 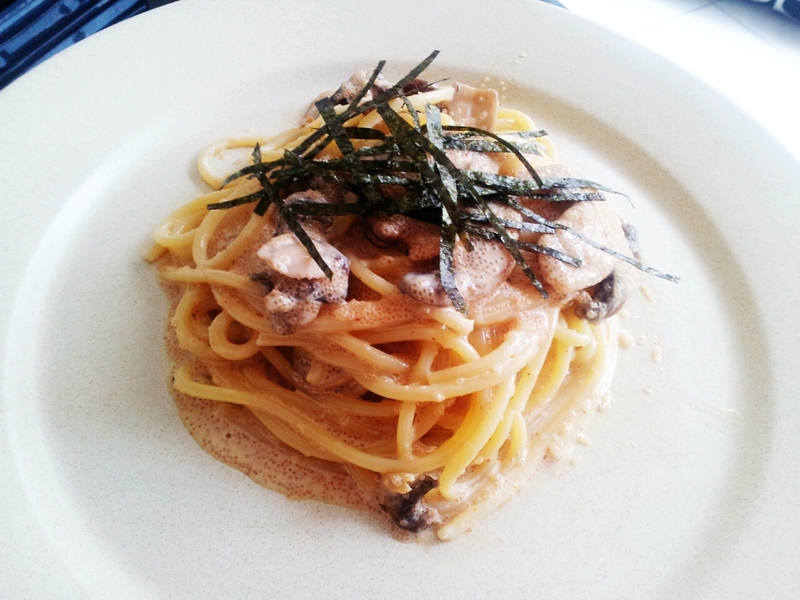 There are many versions of Mentaiko Pasta. 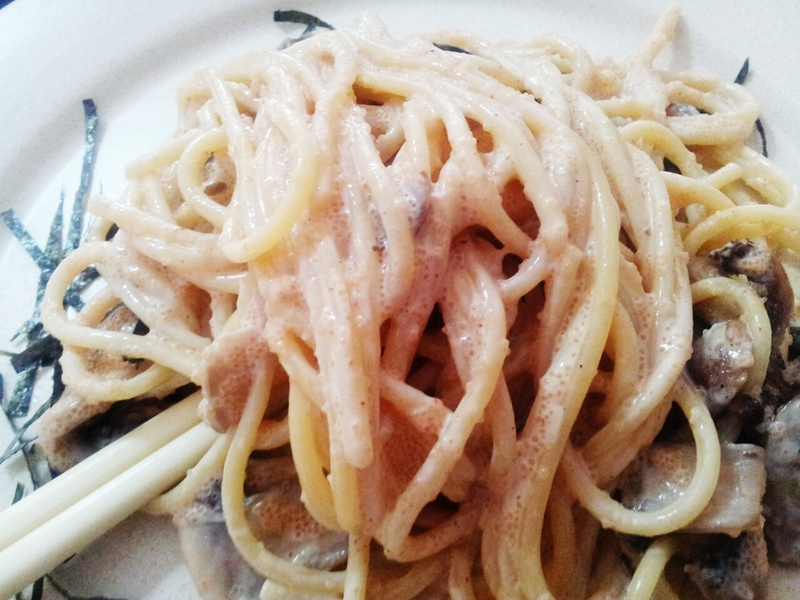 Some come with a sauce, while others were served more Aglio olio style. As I was in the mood to over-indulge, I thought that I might as well go slightly OTT and pair it with a butter and cream sauce. It could be worse, you know. I could have added a poached egg, or wine. Hehe. In all seriousness though, this is so good I actually licked the plate clean (sorry for the bad visual… but I was eating at home and noone could see!). Not many dishes can do that to me. Best thing is, this only took less than 15 minutes! This has to be one of the most delicious things you can make with that amount of time. It’s so unbelievably easy there’s only 2-step process involved. Ok. 3 if you count the sautéed mushrooms. Look at this delicious mess! Cook the pasta according to packet’s instruction in salty water until al dente. 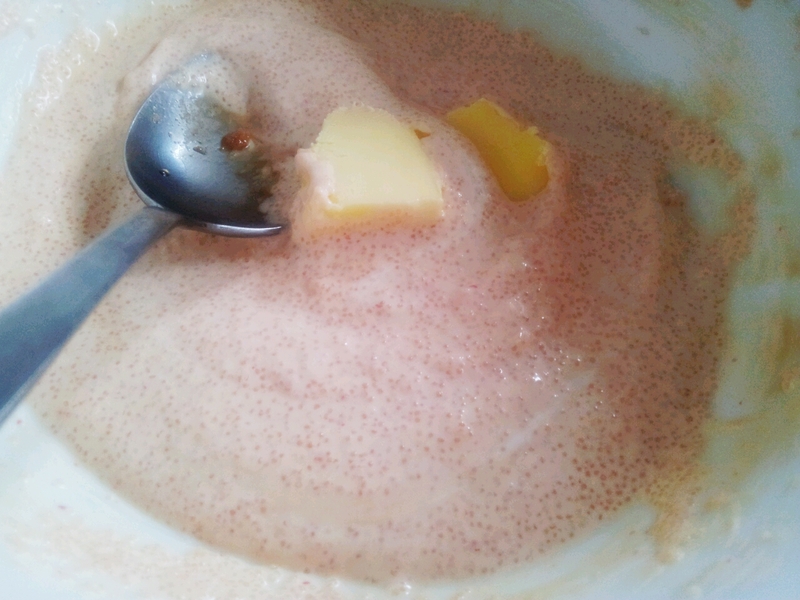 To make the sauce, make the cut on the sac and squeeze all the roe out, and mix with Shoyu, Mayonnaise Cream and Butter. Sauté the mushrooms in butter and add to the sauce. Mmmmm… I would be lying if I said I didn’t steal a spoonful of out this. Once the pasta is cooked, drain well and add to the sauce to mix. Let it sit for up to a minute to absorb some of the sauce. Garnish with Nori before serving. I could have this everyday. Actually I did have it two days in the row but I ran out of Spaghetti for day three so I had Mentai Gohan instead. Cholesterol? What’s that?! Each strand coated with copious amount of roe! This is too much! Well excuse me now, as I need to look for my running shoes. Wow, this look so tempting and good ! Totally love the idea of putting nori sheets on top of pasta! Looks fantastic! Heheh I’m a bit obsessed with putting seaweed on noodles and rice. I loveeeeee mentaiko as well. Tried it for the first time at Sage and was absolutely hooked. Now you can easily make it at home! Defnitely would be way cheaper than sage hehe. hi kelly, i’ve not tried mentaiko but i like salted fish. Looking at the pictures now, i bet this is really tasty and delicious! Love THIS! hmmm… where can I get this in Sydney. Penny, my friend got some mentaiko from Miracle in World Square… Not sure if that’s close to you? This looks sooo delicious!! My husband would really love it, thank you very much for sharing the recipe!! When the kids are all left ( I’m not looking forward to it! ), I’ll reward my husband with this dish since I’ve completely neglected him all summer when my children are home and my nephew with his friend are here. The mayo goes so well with mentaiko so I had to include it! It adds a richer taste to it too. Hopefully you can find mentaiko over there!